Series creator and ongoing writer Brian Wood paints an unsettlingly relatable picture of a United States so divided it's settled on civil war as its only option. He raises some pertinent issues, escalates the conflict of ideas that's already present into a physical struggle, and adds just enough dashes of the modern rhetoric to make it all feel natural. Is it idealistic? Well, yes and no… on one hand, I don't think anyone wants this to end in bloodshed, but on the other, the two sides of this country are already so sharply divided that eventually something's going to have to give. I don't know how we go from criticizing the President on a daily basis to taking up arms and rising against his government, but should that come to pass I wouldn't be surprised if it wound up looking an awful lot like this. Kristian Donaldson has joined the party as a special temporary artist for this story arc, delivering work that's as simple as the issue's subject matter is heavy. 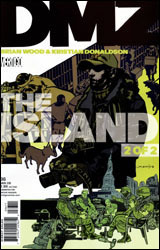 Fans of Brian Wood's work will recognize Donaldson from their previous collaboration on IDW's Supermarket. His uber-minimal approach is reminiscent of Phil Hester, though the DMZ artist isn't quite as animated and his characters don't feel as natural. Tasked this month with representing a US Army captain at the end of his rope, Donaldson is able to capture enough facial expression to tell that story without the aid of narration. The captain has crazy eyes, his body language betrays his mental state, and the tendency of his underlings to keep their distance tells us they don't entirely trust their fearless leader. Though his characters occasionally feel stiff and uncomfortable, Donaldson is otherwise a solid contributor. DMZ is a rarity in that it can tell a deeply political story without feeling heavy-handed or preachy. Brian Wood's continuous use of recognizable talking points and familiar imagery lends familiarity, and that in turn helps the story to connect with its audience. It's pertinent, timely and elaborate, something worthy of a chance, regardless of your political affiliation. Buy it.